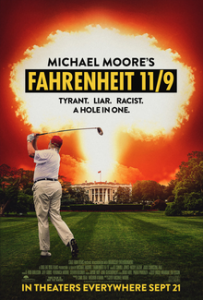 This month, I have seen several promotions for Michael Moore’s new movie Fahrenheit 11/9. Although it has been previewed in Toronto and Flint, September 21st is its official release date for around 1500 theaters. And despite its title, Fahrenheit 11/9 is less interested in the day of than it is in all the days leading up to and out of it. Likewise, the film is less about Trump as a singular figure than he is in Trump as a product of, an catalyst for, all the forces surrounding him. Michael Moore basically wants people to protest Donald Trump or at least vote against those who may support him. Filmmaker Michael Moore thinks it’s possible President Trump will be the last U.S. President. Well, if we see the fulfillment of the deal in Daniel 9:27 within the next few years and Donald Trump is re-elected and survives, this is possible. But it will be because the Great Tribulation would have started in his second term. We will continue to watch events in the Middle East and elsewhere to see if Daniel 9:27 is about to be fulfilled (more on that can be found in the sermon: Daniel 9:27 and the Start of the Great Tribulation). Michael Moore’s 11/9 ‘documentary’ seems to be timed to try to lull anti-Trump people to decide to do something, like encourage others to vote against those who could support Donald Trump. Michael Moore was one of relatively few on ‘the left’ who repeatedly stated that he thought Donald Trump would win the 2016 presidential election. He, like I, spent a lot of time in Michigan growing up and realized how many of the middle class people there think. As it turned out, almost all voters I knew in Michigan or from Michigan, were Trump supporters (for my views prior to the election, watch the video: 10 Reasons Not to Vote for Donald Trump or Hillary Clinton). Now, Michael Moore does not like Donald Trump. And personally, I consider that Donald Trump is a bully, unreliable, etc., etc. as I told some relatives in Michigan this Summer. I also had some less than flattering comments related to Hillary Clinton. Neither one of them practices biblical Christianity and both have made that publicly obvious. Of course, the solution to problems in the USA is not to be against (or for) Donald Trump or Michael Moore. The biblical solution is to properly repent, accept Jesus, etc. (Acts 2:39) and work to support the fulfillment of Matthew 24:14 so the end will come and Jesus will establish the millennial portion of the Kingdom of God on this planet. But others have their own ideas. While I believe that Donald Trump has many of those negative qualities, so did his main opponent in the 2016 election, Hillary Clinton. That being said, the main political parties in the USA are becoming more polarized. While politicians were always partisan, there is less they seem willing to do for the ‘good of the country’ together. Civil unrest and/or civil war is going to hit the USA. Michael Moore is entitled to his opinions, as is Donald Trump. But the USA is more and more becoming divided. Various ones in the media have been fanning the flames of strife and division, and I expect them to fan them more. It seems to be that Fahrenheit 11/9 is intended to fan the flames as well. The USA is not exempt from falling, and ” a house divided against a house falls” (Luke 11:17)–ultimately, the USA will fall (cf. Daniel 11:39; see also USA in Prophecy: The Strongest Fortresses). Does God Have a 6,000 Year Plan? What Year Does the 6,000 Years End? Was a 6000 year time allowed for humans to rule followed by a literal thousand year reign of Christ on Earth taught by the early Christians? Does God have 7,000 year plan? What year may the six thousand years of human rule end? When will Jesus return? 2027 or 20xx? There is also a video titled The 6000 Year Plan: Is the end of humanity’s reign almost up? This entry was posted on Thursday, September 20th, 2018 at 7:00 am	and is filed under Prophecy. Do You Want to Be a Bible Millionaire?